Keswick is the majestic leader in traditional office environments. 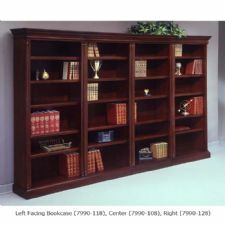 An impeccable English Cherry finish on cherry veneer with veneer tops and refined styling in solid wood pilasters and mouldings offer unmatched luxury. Desks feature felt-lined center and top drawers and central locking. Pull-out writing shelves offer extra work area at your fingertips. Decorative wood accent mouldings, recessed modesty panels, and decorative, plated brass, swinging bail hardware come together to create a rich traditional look. Top surfaces are detailed with decorative cherry inlay veneer and walnut banding with a UV finish. 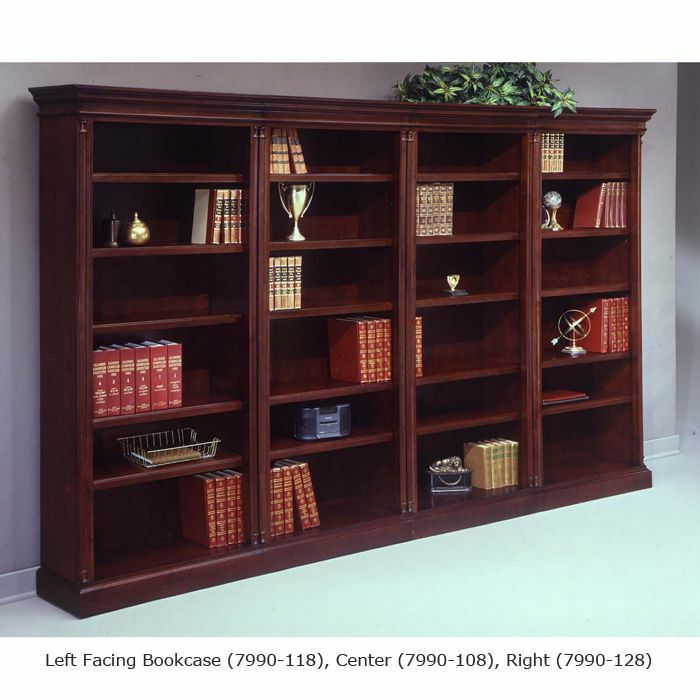 The Keswick Collection consists of wood, wood veneers and wood materials featuring solid wood bases, shaped mouldings and pilasters with an English Cherry finish. Tops are constructed of wood and veneer materials. 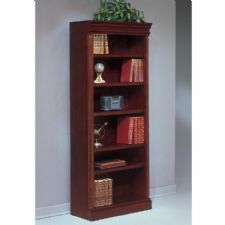 Veneer tops feature decorative inlaid cherry veneers bordered by a walnut banding. A UV finish provides protection against discoloration from sunlight. Cases feature mortise and tenon construction with wood cleats, glue, screws, staples and threaded inserts with bolts. Drawers are constructed with solid wood sides and backs, veneer fronts with veneer edge bands and three-ply veneer bottoms. Drawer interiors are stained and sealed and showcase dovetail construction. All drawers are suspended on fully extending, metal, ball-bearing slides allowing easy access to the entire drawer. Box drawers have a 100 lb. load bearing rating. File drawers have a 150 lb. load bearing rating and are equipped with metal rods to accommodate front-to-back letter or side-to-side legal sized hanging file folders. Computer applicable furniture feature grommets or other openings that facilitate neat and easy management of computer cables. Desks, credenzas, and returns include convenient pull-out writing boards for an expanded work surface. If you notice a defect, it is important for you to act promptly and immediately notify the Authorized dealer from whom you purchased your furniture. Your notification must be given to an authorized DMI dealer with proof of purchase. After notification, it may be necessary for the Authorized Dealer or the manufacturer to arrange for an inspection of your furniture to determine whether or not a covered defect exists. If a covered defect does exist, it will be repaired. If it is determined that repair is not practical, you will be suppllied with new furniture of the same or similar color, design, style and quality at the current price less the depreciated value of the product as based on ASB standards for straight line depreciation. You will not be charged for any repair services, delivery costs. Implied Warranties. No implied warranties including warranties of merchantability or fitness for a particular purpose exist. By implied warranties, we mean ones that the law requires to have been given by the seller even though they are not set out in writing. Please note: some states do not allow an exclusion or limitation on how long an implied warranty lasts, so the above limitation or exclusion may not apply to you. This limited warranty protects you only when you purchase furniture from an Authorized Dealer. This limited warranty applies only when you have purchased the furniture for your own use and not for resale prior to use. Your furniture requires some routine maintenance. Keep it clean, dusted and polished as necessary. Proper care and use are essential to preserving the rights under this limited warranty. We will not repair or replace your furniture if damage is caused by improper maintenance or by improper use. This limited warranty does not cover damage resulting from abuse, normal wear and tear, accidents including burns, cuts, scratches, scuffs, watermarks or indentations. Consequential or incidental damages are not covered under this limited warranty. By this we mean any loss, expense or damage other than to the furniture itself that may result from a defect in the furniture. Please note: some states do not allow the exclusion or limitation of incidental or consequential damages, so the above limitation or exclusion may not apply to you.